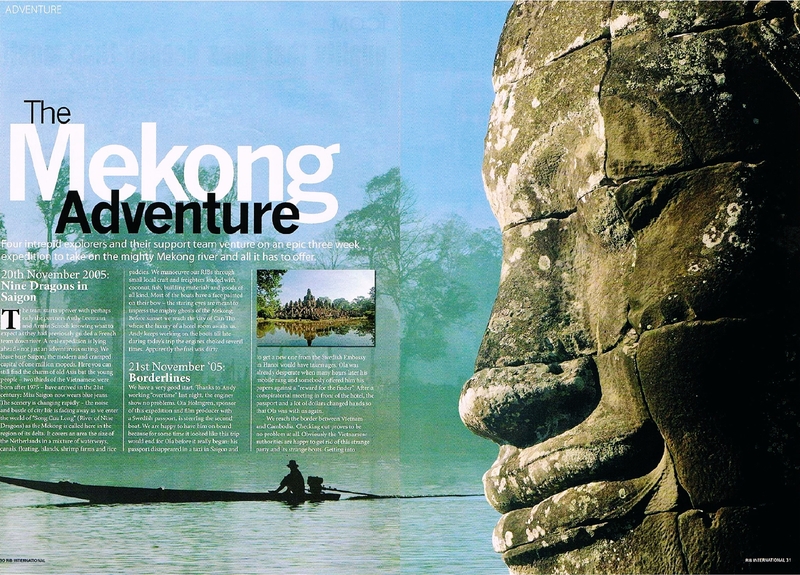 to take on the might Mekong river and all it has to offer. The team starts upriver with perhaps only the partners Audy Leemann and Armin Schoch knowing what to expect as they had previously guide a French team downriver. 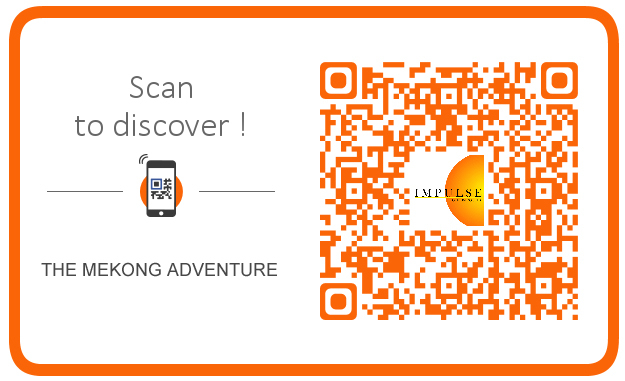 A real expedition is lying ahead not just an adventurous outing. We leave busy Saigon, the modern and cramped capital of one million mopeds. Here you can still find the charm of old Asia but the young people-two thirds of the Vietnamese were born after 1975-have arrived in the 21st century : Miss Saigon now wears blue jeans. The scenery is changing rapidly-the noise and bustle of city life is fading away as we enter the world of “Song Cuu Long: (River of Nine Dragons) as the Mekong is called here in the region of its delta. It covers an area the size of the Netherlands in a mixture of waterways canals, floating, islands, shrimp farms and rice paddies. We manoeuvre our RIBs through small local craft and freighters loaded with coconut, fish, building materials and goods of all kind. Most of the boats have a face painted on their bow-the staring eyes are meant to impress the mighty ghosts of the Mekong. Before sunset we reach the city of Can Tho where the luxury of a hotel room awaits us. 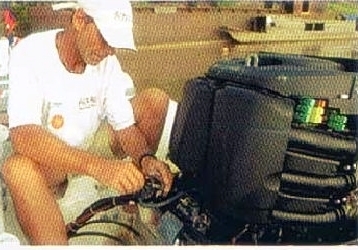 Andy keeps working on the boats till late during today’s trip the engines choked several times. Apparently the fuel was dirty. We have a very good start. Thanks to Andy working “overtime” last night, the engines show no problems. Ola Holmgrem, sponsor of this expedition and film producer with a Swedish passport, is steering the second boat. We are happy to have him on board because for some time it looked like this trip would end for Ola before it really began : His passport disappeared in a taxi in Saigon and to get a new one from the Swedish Embassy in Hanoi would have taken ages. Ola was already desperate when many hours later his mobile rang and somebody offered him is papers against a “reward for the finder”. After a conspiratorial meeting in front of the hotel, the passport and a lot of dollars changed hands so that Ola was with us again. to watch the dragon boats. We reach the border between Vietnam and Cambodia. Checking out proves to be no problem at all. Obviously the Vietnamese authorities are happy to get rid of this strange party and its strange boats. Getting into Cambodia is another affair and we get a lesson in bribery. Everybody has to pay at this border. For local tradesmen bribe-money can be counted in cents, for normal backpacker tourists it is about five dollars and already included in their boat fare and for us? …At the end it takes the officials four hours to decide if and for what amount of money they will let us through. We had to wait hours, smiling at the guy in flip-flops with a towel around his hips who proves to be the boss of this border post. When we are finally on the road again, there is no time to loose. We want to reach Pnomh Penh before darkness because the floating objects in the river are even more dangerous when you do not see them. The engines are giving us trouble again. 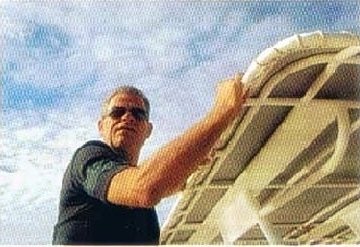 Andy assume that the gasoline is not only diluted with water but also contains sediment that obstructs the filters. We have to drive slowly. It is pitch dark when we arrive in Pnomh Penh. Water Festival “Bon Om Tuk” in Pnomh Penh. The whole town is one big festival park during this three-day-event. Local people celebrate an incredible natural phenomenon-the change of the current. During the rainy season the Mekong is so strong that it changes the direction of its tributary, the Tonle Sap river, so that is begins to literally flow uphill. The Mekong pushes its waters into the Tonle Sap lake that functions as a natural reservoir, and it is not until the dry season that the Tonle Sap river changes direction again. 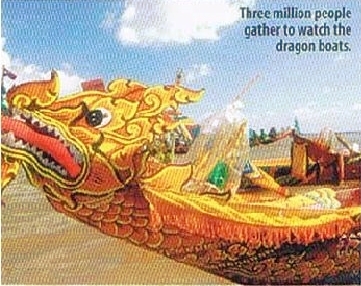 We watch the dragon boat races, perhaps the most spectacular even of the whole festival, 20,000 rowers, about 65 in each dragon boat, compete in the races on the Mekong. 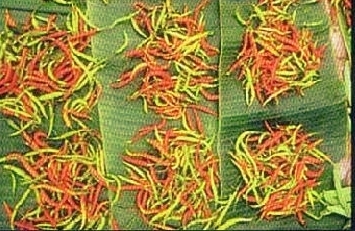 During the regime of PolPot and his Red Khmer the festival was forbidden. The races started again in 1990 and today they are more popular than ever. This year about three million people gather along the river banks to watch the dragon boats. Under way again. We pass through rural Cambodia. No more ships, no more plastic waste on the riverbanks, very few people, only some fishermen in their small boats. Slowly the river begins to resemble the descriptions left to us by participants in the French 19th century expedition. But where there are no people and no villages, it will become more and more difficult to find help should our engine problems continue. The biggest obstruction for navigation, the Khone Waterfalls, also called the “Niagara of Asia” are now one day ahead of us. 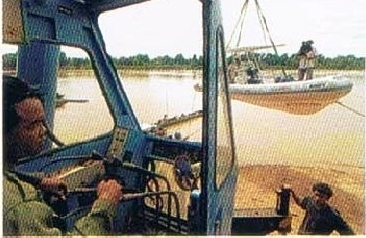 The Mekong becomes more and more interesting now. We navigate around big shoals and little islands where farmers plant corn. Rocks appear and little rapids and cascades gurgle over black stone and through tree trunks and branches in the riverbed. Then a muffled sound and the engine dies-we hit something. Just like after pulling the emergency brake some of us fall over. Andy’s diagnosis does not sound promising. The gearbox seems to be broken. 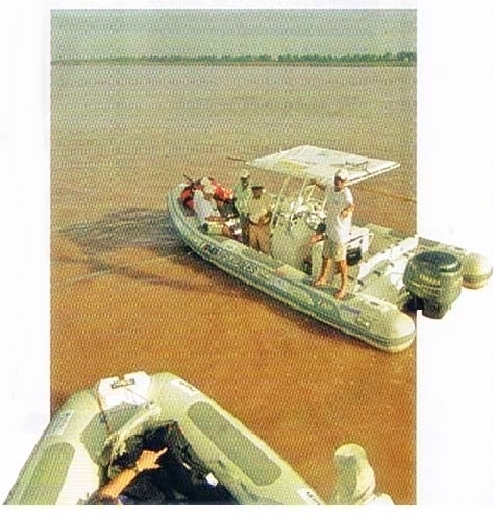 A local speedboat takes luggage and crew members to a guesthouse not too far away. Armin, Andy, Helge and Klaus stay with the two RIBs. Towing the one with the damaged gearbox we are literally crawling upriver. With the last of the daylight we stop on the riverbank. We are right in the middle of nowhere and have to spend the night on the boats. Dinner is a small sandwich for everybody but luckily we have enough water and a bottle of whisky that Armin keeps on board for emergencies. Since the beginning of the expedition this would be by far the most beautiful night-if it were not be for the broken gearbox. We drink whisky, smoke cigarettes and just look at the clear starry sky. Tomorrow we have to get to the Laos where there are easy connections to Thailand. A spare engine is waiting in Bangkok for an emergency like this one. After a nice but uncomfortable night it takes us four hours to cover the last thirty kilometers to the border between Cambodia and Laos. Now Armin demonstrates what a genius he is in logistics: under the eyes of about one hundred spectators from the village of Veun Khan, the RIBs are craned out of the water and put on a truck. With engine, fuel and luggage each one weighs about 1.5 tons. One goes back into the water on the other side of the Khone Falls, the other one is transported to a place name Pakxe, not far from the border with Thailand. If everything goes well, the new gearbox is due to arrive the next morning. 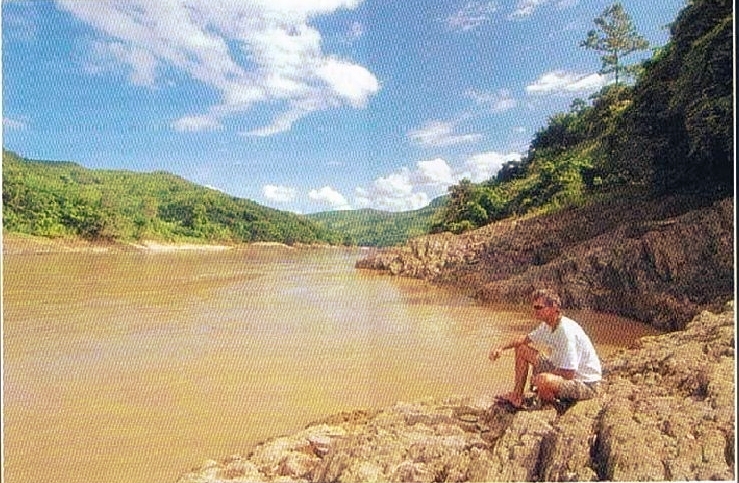 Above the Khone Falls, the Mekong is about 15 kilometers wide. Hundreds of small islands divide the river before the water suddenly plunges into the abyss. The water does no go down as deep as in Niagara but the falls are wider and the river propels its waters much faster through the cuts. There is nothing left of the river’s light brown color-it is all just white water and spray now. 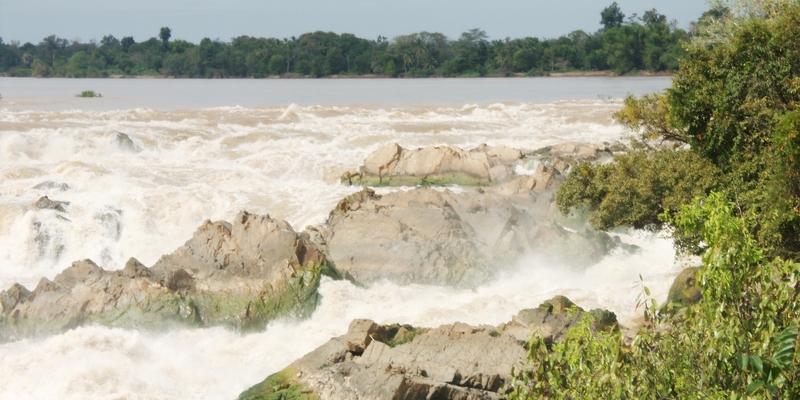 No wonder that the Mekong has the reputation of being the wildest of the Earth’s ten biggest river. 1st December 2005: 4000 Islands. We are in “Si Phan Don” (“4000 islands”) as the Laotians call this region. Here the Mekong is so wide that you would not recognizable it as a river. It has changed into a magic water world. This unique region of wetlands is full of wildlife and consists of small canals dotted with tiny islands. One and a half centuries ago the French expedition was confronted with tigers and alligators in this area. Nowadays the wildlife is less dangerous. We see water buffalos enjoying a bath in the mud, birds are all around and biologists found out that more than 200 different species of fish live here. It is reported that about ten river dolphins still live here-a species that is almost extinct. While Andy stays with the boats the crew makes an excursion to the famous Khmer temples of “Vat Phou” hidden in the wilderness about 12 kilometers of the river. It is the remoteness of the location that makes for the special appeal of these impressive forest temples that have been declared a UNESCO world heritage site. But the question of the day is-will the new gear box arrive: The technicians bringing it from Pattaya in Thailand will have to smuggle it over the border to Laos. 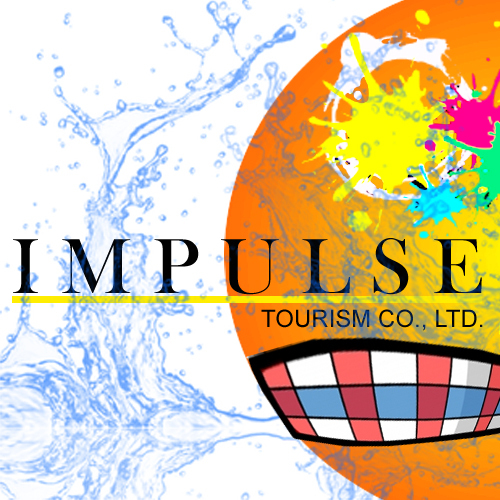 The legal procedure with customs clearance and all the paperwork would take at least a week. 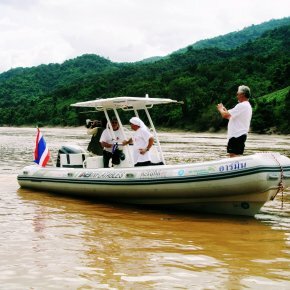 By that time all our permits for the further trip upriver would have expired-the official authorities did not allow for a more relaxed time frame. When Andy finally watches the two mechanics passing the border without a problem and smuggling the spare part into Laos, his relief is obvious. The gearbox we were so desperately waiting for is installed quickly. Only 48 hours after the breakdown we have both boats in the water and running again. And we thought the gearbox-story had ended yesterday. Bed luck seems to be with us. Now it is the engine on the other boat that is showing the same “symptoms”. Instead of the healthy hum of a well working engine, there is this nasty “clack-clack-clack” sound. Obviously it had hit a stone. 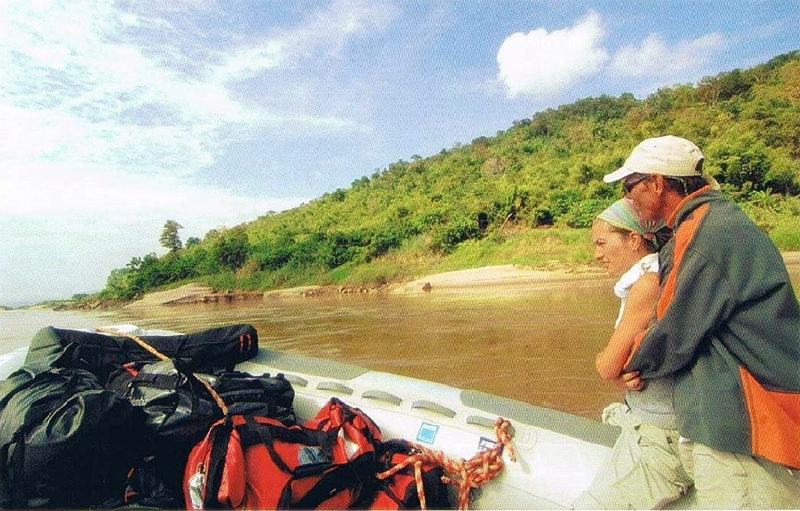 There is no spare engine left and we are about to enter the dangerous rapids of Pak Saeng and Song Khon. Should the engine fail completely while passing the rapids-the RIB would be on the rocks in no time. We decide to tow it. We are so slow now that we will never be able to reach Thakhek or Savannakhet in daylight. After sunset Siggi is taking out his night vision glasses and finally spots some distant lights on the riverbank. We stop. Andy and the local guide get permission from the village chief that the whole crew might stay overnight. Chief Bunasak offers us his community house and within half an hour the floor is covered with little bowls: chicken soup and omelets for the strange party of the ‘rubber skin boats’. While they watch us eating, our local guide has to answer a lot of questions. Prepared for a night on the hard floor, the mattresses a villager organized for us seem to be a real luxury and we are fast asleep. Tomorrow we will continue on to Thailand and try to get the broken gearbox fixed. The team splits up-a difficult decision. 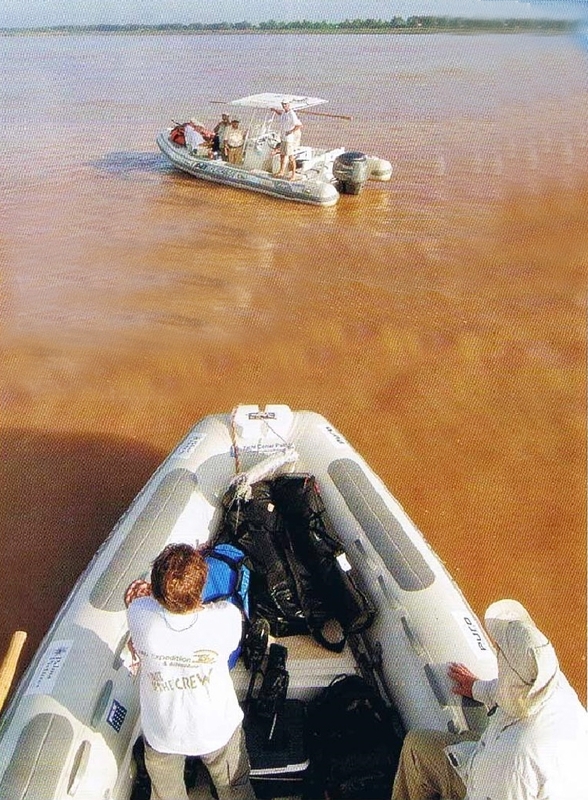 Armin, Ola, Mats and René continue upriver with one RIB, while the rest of us stay together with Andy on the damaged one. A new gearbox coming from Spain is on its way to Thailand. But how can you convince a customs officer to release it-not within a few days but right now? Andy tells him that the whole world is watching this expedition as all major TV stations cover the story. Does he really wants to be the one to stop us? He Does not. In the evening we get the call we have been waiting for. The gearbox has arrived in Bangkok. The Luang Prabang night market. It took three days to get the gearbox to Mukdahan in Thailand. But now-we can hardly believe it-all our problems seem to have been solved. 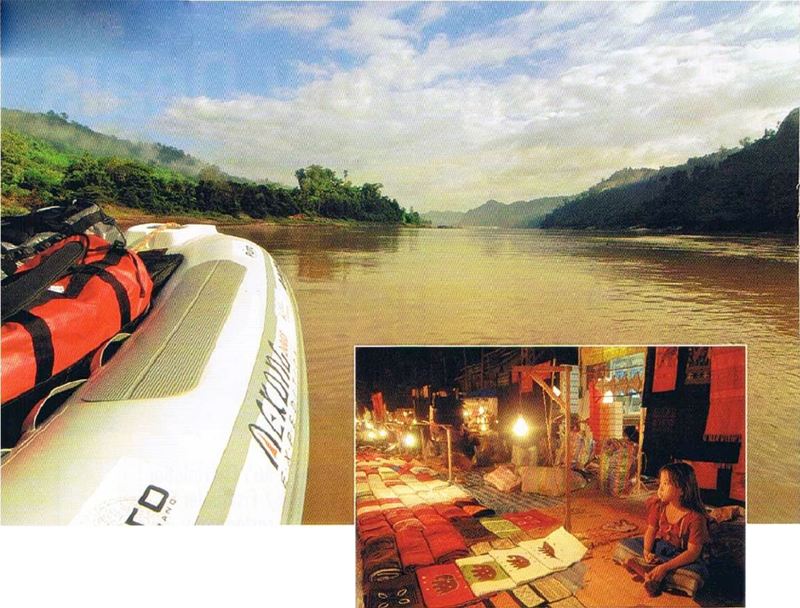 We clear customs in Thailand and check in to Laos on the other side of the river. 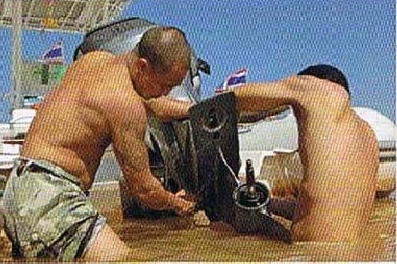 The engine runs beautifully, and we are able to fill all the tanks with good, clean gasoline from Thailand. We will try to make good speed to get back to the other half of the team that now is well ahead of us. Since we entered Laos we have had an official from the Laotian tourist police on board. 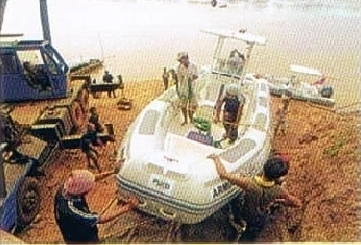 To accept him on the boat had been an indispensable condition of the Laotian ministry granting a permit to travel in Laos. Luckily, Buntan is very nice guy and not a grim functionary. The only thing he is making a lot of fuss about is this small brown package he carries. It takes us some time to find out that it contains a transmitter. The secret service definitely wants to know where this strange party is going with its strange boats. 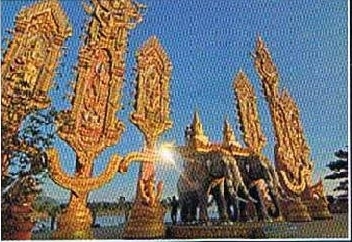 What connects Laos with Thailand? 1754 kilometers of common border, and just one bridge. The so-called Friendship Bridge at the capital of Vientiane is present from the Australian Government and one of the very few bridges spanning the great river. The bridge is connecting people that are separated by a river and a country border but are closely connected through a common language and culture. This is a paradise from smugglers; we meet them and their small craft everywhere on the river. They carry bicycle spare parts, blenders and little stoves. From dusk to dawn the smugglers are most active, protected by the night, when sneaking past customs is easy. Petty smuggling it one thing, drug traffic or illegal export of exotic wood from Laos to Thailand is another. Opium, teak and mahogany are the most important Laotian export goods and get into Thailand via the Mekong. We are doing sometimes more than 250 kilometers a day and there is not much time left for stopovers along the way. We are on a tight schedule because of the time lost while waiting for the spare parts but on top of that the Laotian authorities keep us in a fixed time frame. They normally want Western tourists to stay in proper hotels and do not like us to sleep in the little villages as we often do. But today it seems that we will be able to stick to our schedule and reach the village of Paklai in due time. We make good progress thanks to our pilot Saman who professionally guides Andy through the rapids and abound sharp rock formations. We spent the night in a guesthouse. 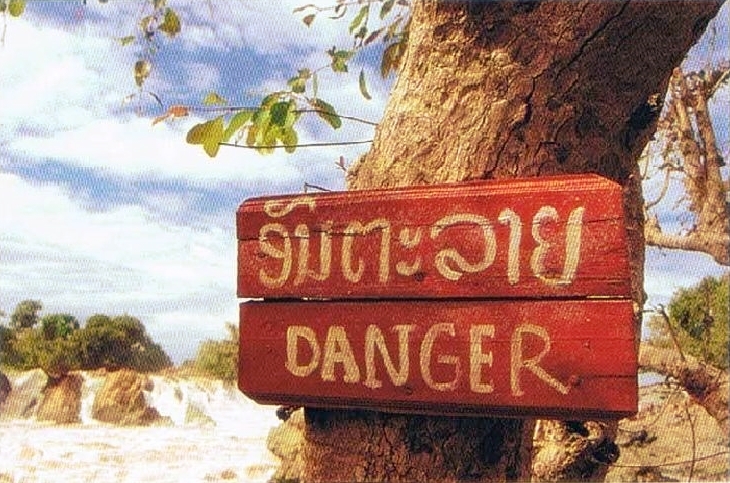 According to Saman we will have even more wild waters tomorrow on our way to legendary Luang Prabang. Where the 19th-century explorers had to pull their boats by hand because the rapids made rowing impossible, we can drive and enjoy the wild scenery of misty mountaintops, rocks and dense tropical forest. With the help of our pilot Saman, we manage the trickiest passages very well. 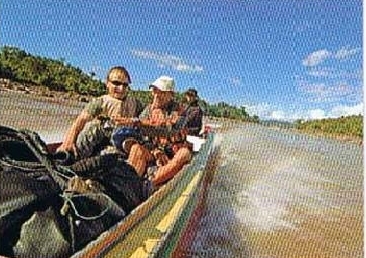 Andy admits that the Mekong is ten times as strong as anything he experienced traveling 12,000 kilometers of river in Latin America. We see few villages now. The roofs of the nuts are covered with straw-corrugated iron sheets have vanished completely. The children are no longer waving at us but just stand there, staring at the “long noses” in their strange boat. All settlements keep their distance from the river. For good reason; The Mekong is now flowing in a very narrow bed and the difference in the water level can reach about 20 meters between the rainy and dry seasons. At one place we see small huts where women pan for gold. 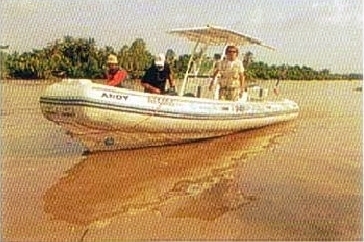 It is just small particles they wash out of the brown river mud. A team of a dozen women recover about 15 grams in a whole month. Not much, but enough to survive in a country like Laos. In the evening we reach Luang Prabang. We’ve decided to give the whole of the next day over to enjoying this city surrounded by the mountains and the Mekong. 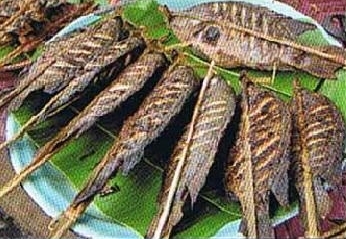 Grilled Mekong fish is available from the night market. Women of the Hmong tribe with necklaces shimmering in the dark and their young children sell weavings and embroideries. Elaborate woodcarvings are available very cheaply. The French explorers were delighted when they saw this market-they were excited to have found a trading place in the unknown lands North of Laos. We are in the ‘country of a million elephants’. They are still employed as real working elephants dragging trees on steep mountain slopes and helping to load them on freighters. But they can only do this hard work for between 15 and 30 years. And after that: How can a Laotian farmer continue to feed an animal that needs 300 kilos of greens per day? The German Markus Neuer built them a special kind of retirement home, the elephant park of Luang Prabang. Here they have less stressful jobs and serve as riding elephants for tourists. Lao can learn from Thailand where elephant camps already are a major tourist attraction. 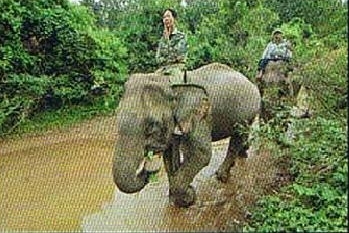 Tourists can live with the animals, care for them, feed them and learn how to ride them in a crash course as a ‘mahout’. A good business and to the mutual benefit of all-retired elephants can enjoy a good life, the tourists have fun and Laos keeps its fame as an elephant country. Luang Prabang is the Laotian Kings residence where they ruled for over 1000 years until the last monarch was deprived of power by the communists in 1975. 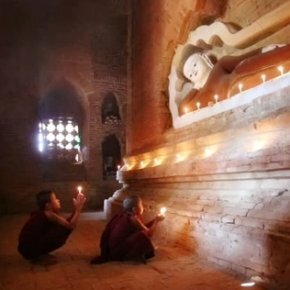 Twenty years later the oldest undestroyed temple city in South East Asia was declared a UNESCO world heritage side. And although the kings had to leave, the faith remained-Luang Prabang continues to be the country’s religious centre-Buddhist monks in their shining gowns can be seen everywhere in the city. In the early morning they are out in the streets for “dag bat” and have to beg for their food in a long procession. 2000 monks and novices live here in 29 monasteries. There might be internet cafés and burger restaurants in Luang Prabang but the daily begging for alms has remained largely unchanged through the centuries-except perhaps for the tourist that now stand on the side of the streets watching the orange procession pass by. We continue upriver following the other expedition boat ahead of us, unsure if we will be able to catch up with them. The Mekong now leads us westwards-a fact that confused the French explorers because they suspected, correctly, that its spring lay to the north, in Tibet. We spend the night in a small place named Pakbeng and receive a welcome in fluent German. Gaosadeth Khennavong, manager of our guesthouse, studied in Leipzig for five years. 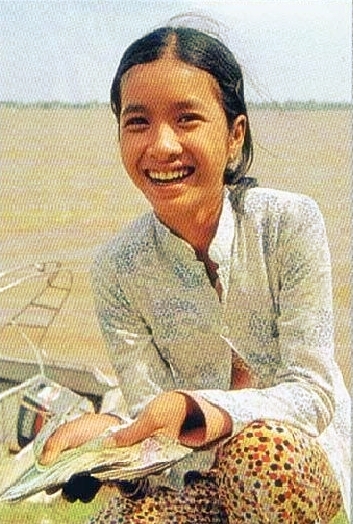 More than 2000 Laotians studied in the former German Democratic Republic as part of an organized exchange programmed between socialist ‘brother countries’. Laotian gasoline is about to kill our engine completely. Will our expedition fail? 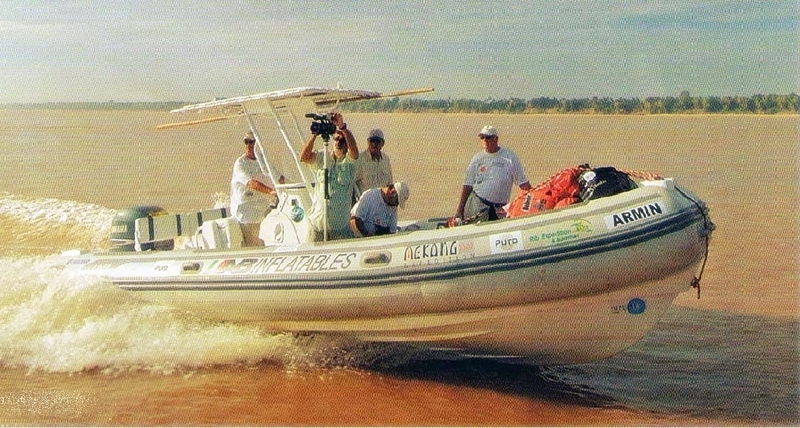 The reports of the team on the other boat further upriver do not give us any hope. They had the same problems and finally left the RIB behind. Armin booked local speedboats and made it to China. There will be no reunion of the whole team at the final destination. Ola and Mats have already left. And what about us? Every five minutes the engine is choking, again and again the motor dies completely-long seconds until Andy manages to coax it back to life. The current gets stronger and we make less and less progress. 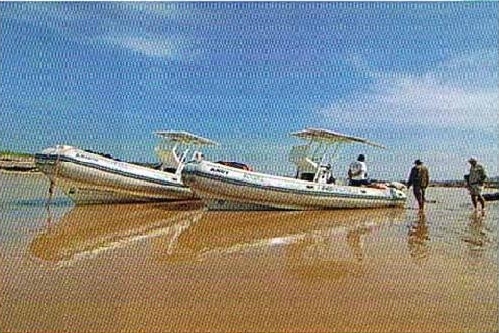 Our plan is to take over the abandoned second boat in Houay Xai, our destination for today. We now rinse the gasoline filters every half hour and one crewmember is continually pumping to ensure that the engine always gets enough fuel. We are now looking for a boat to get rid of some weight. Finally Siggi Stamm and Andy’s girlfriend Jaja leave us taking with them nearly all the luggage. At this time they do not know that their boat will average with a broken engine and that they will have to spend the night on the water. We proceed at snail’s pace with the RIB. 25 kilometers before we reach today’s destination it is so dark that we cannot risk continuing. There are nice villages on the Thai side of the river but we do not have clearance papers from Laos so that we would enter Thailand illegally. To explain that to a Thai police officer is not a very tempting prospect. Them we see a house on the Laotian side. Its inhabitants find it very funny that some crazy whites stop at their house in the middle of the night. Houay Xai is not too far away and we find somebody who drops us off at a guesthouse. 14th December ’05: Surrender? Not quite. A decision has to be made. For 20 second the engine is running normally and with full power. Than it is choking again. We have to throttle down. We move ahead 100 meters and then drift back 50 meters. Andy declares that the expedition will end in the Golden Triangle. In Chang Saen, centre of the notorious Golden Triangle, the boats will be hauled out. It is very hard. The boats are ideal for this trip, but with these engine problems we cannot go any further. Partner Armin Schoch is already waiting for us. Within half an hour the boats are on a truck. End of the story?-Not quite. We discuss the possibilities. The French expedition in the 19th century needed one and a half years to reach China. They did not give up-although they had to face many more difficulties. Is it right to surrender to some technical problem? No-our minds are set to reach China by river. 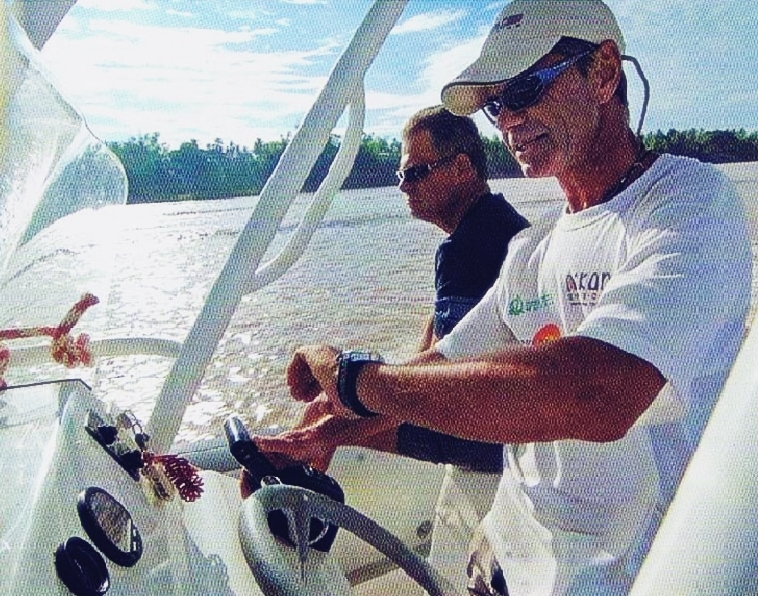 Armin finds us a Laotian speedboat pilot who will take us to China the next day. The wildest and possibly most beautiful passage of the river lies ahead of us. 15th December ’05: What a river! It seems that the Mekong wants to reward us for our endurance. It was never prettier than today. Narrow as a mountain river in the Alps, it punched South with all its power. The current it incredible. The little freighters that come our way are dancing on the current. 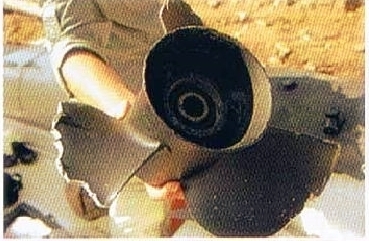 More than anything else they look like dented tin cans-undoubtedly they hit the rocks many times. We are not allowed to stop anywhere. We officially left Thailand and there is no Laotian border post where we could check in. Burma it to our left and nobody knows if the Burmese army controls this region or if it is in the hands of a alliance of some tribes. We rarely see people along the riverbanks. From time to time the houses of an Akha village can be seen through trees. In ther old days this mountain tribe came down from Tibet and went as far as Northern Thailand. With sign language we ask our guide to stop for a moment. He is shaking his head and crosses his hands to indicate that we would be handcuffed and thrown into jail. There is no fooling around with Burmese authorities. But a little later we have to stop and refuel-on the Laotian side. There is a pile of rice sacks beside a small path leading up the mountain. An old woman and a little boy try to move them. They are looking at us shyly. Andy does not hesitate and puts a sack on his bag. The woman is pointing up hill. We enter a village free of corrugated iron sheets and plastic but full of people that stare at us as we stare at them. Women wear traditional attire. Their headdress is fantastic, just dazzling silver, pearls, coins and feathers. The chief decides that we have to drink a cup of tea. Then our pilot appears, really annoyed with us. We have to go back to the boat. The whole village comes down to the boat for our good-bye. We give them all the sandwiches we have left. Very likely we are the first Europeans they have ever seen. There are no tourists in this region. Dense fog covers the mountains as we pass the last checkpoint of the Laotian army. After the next river bend we spot a harbor with a dozen freighters and a flagpole with a red piece of cloth. We are in Guan Lei, China. After three weeks and 3150 kilometers we have reached our final destination. 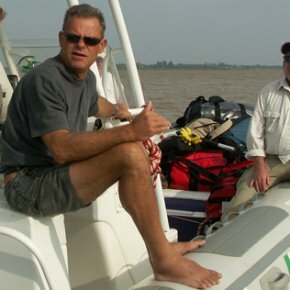 Andy Leemann leader of the Mekong expedition is unusually quiet. “We made it,” he whispers.